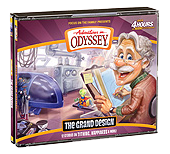 Those waiting for Adventures in Odyssey’s latest audio album, The Grand Design, can expect to see the hard copy available very soon. In fact, a nice supply of albums just arrived at the Focus on the Family Bookstore in Colorado Springs. Brock Eastman, marketing guy for Odyssey, shows off a copy of “The Grand Design” at Focus’s grand arrival of the latest release. The Grand Design should be making its way to Christian bookstores and online retailers very soon. Of course, you can call Focus on the Family at 1-800-A-FAMILY and purchase your copy of the release, or order the album online and have it shipped to you directly. Visit our product page for more information on the album and ordering links. And on a more personal note, I’m very excited to receive my own copy as I worked closely with Tyndale House Publishers and the Odyssey team to bring you the design of this awesome collection. It’s exciting to see all that effort finally come to fruition. More to come!